Vitarade Gel Energy is a concentrated formula used for maximising physical performance during training and effective glycogen restoration after a workout. Optimal composition of the product and its convenient form makes it an essential element of all hard training sessions, especially endurance training. The main task of the supplement is to provide continuously energy for a hard working athlete’s body. To achieve this goal, three different forms of carbohydrates have been used in the preparation which vary in absorption rate and are involved in different metabolic pathways. Consqequently, this ensures a regular supply of energy without sudden peaks of or drops in sugar levels. It helps maintain maximum efficiency of the body throughout the whole physical activity and delay fatigue. Physical performance is enhanced by the addition of caffeine which energises and improves motivation. The product features a strongly concentrated formula in only 45 ml of liquid. Such small volume of the supplement is not only handy and facilitates convenient storage during training. It fills up also sligthly the stomach whose functioning is limited considerably during physical activity. A reduced amount of consumed product minimises the risk of digestive discomfort. The form of the supplement is also extremely practical. Its maximally simplified squeeze pack allows you for consuming the supplement’s portion without interrupting your workout. Its gel consistency is easy to swallow and does not leave a sticky feeling or residue in your mouth. The product is characterised by a pleasant, sweet, but not pungent taste. The basic ingredient of the product is Vitargo, a unique form of carbohydrates derived from barley starch. They have branched structure and great molecular weight, but also low osmolality. The features of Vitargo molecules account for its exceptional properties appreciated by athletes. They have the ability to leave the stomach faster than other carbohydrates. This shortens the time necessary for transporting them into the intestinal absorption barrier. Also enterocyte absorption is faster for Vitargo than other forms of carbohydrates. Because of that, it is a very quickly absorbable source of energy. After a workout, Vitargo helps restore muscle glycogen faster than other forms of carbohydrates. Slightly lower absorption in the supplement has maltodextrin. It is obtained in the depolymerisation of starch molecules and characterised by steady absorption rate. It is an excellent source of energy. Its main advantage, which decides in favour of using it in the supplement, is its unique digestibility. It does not strain much the digestive system whose blood flow and hence efficiency is limited considerably during physical activity. Fructose is the third sugar absorbed in the body and has therefore the longest metabolic rate. Due to complex metabolic pathways in the body, it is the longest releasable energy source among other carbohydrates in the preparation. It prevents a sudden drop in energy during a long training session. The supplement has been enriched with sodium and potassium, mineral compounds which deplete significantly during physical activity and are critical to efficiency of the body’s basic physiological processes. Making up its deficiencies has a beneficial effect on physical performance. It contributes to maintaining efficient intercellular energy systems and muscle excitablity which ensure strong physical performance. 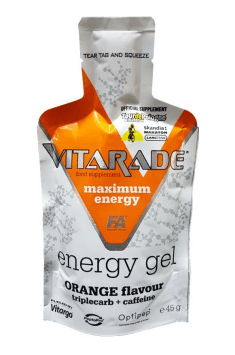 To sum up, Vitarade Gel Energy is an advanced supplement improving training capacity by providing steady energy supply and energising the body. It allows for controlling energy functions of the body during a workout. Consequently it helps make even the hardest training session without problematic drops in energy which limit your excercise capacity. During an intensive workout or endurance contest (shorter than one hour): Consume 1-2 portions (1-2 gels) depending from the kind and intensity of a workout/contest. Consume 1 portion (1 gel) for each 20 minutes of physical activity. During an intensive workout or endurance contest (longer than one hour): Consume 3-6 portions (3-6 gels) depending from the kind and intensity of a workout/contest. Consume 1 portion (1 gel) for each 20 minutes of physical activity. During workouts or team games Consume 2-3 portions (2-3 gels) depending from the kind and intensity of a workout/contest. Consume 1 portion (1 gel) for each 20-40 minutes of physical activity. During strength training: Consume 2-3 portions (2-3 gels) depending from the kind and intensity of training. Consume 1 portion (1 gel) for each 20-40 minutes of physical activity. During long trips as a source of carbohydrates: Consume 3-6 portions (3-6 gels) depending from the kind and intensity of physical activity. Consume 1 portion (1 gel) for each 60-90 minutes of physical activity. During daily activities as a source of carbohydrates: Consume 2-3 portions (2-3 gels) depending from the kind and intensity of physical activity. Consume 1 portion (1 gel) for each 60-120 minutes of physical activity. The formula works amazingly as a post-workout source of energy which does not only aid in restoring glycogen but also slightly energises the body, reducing symptoms of fatigue. To achieve this result, it is suggested to use 2 or 3 portions of gel depending from your body weight and intensity of a training session. The preparation is effective during a carbo-loading regimen. The dosage of the supplement should be thus suited to your individual diet plan. Water, maltodextrin, fructose, corn starch (Vitargo®),sodium chloride, acidity regulator (citric acid), flavors, potassium chloride, caffeine, preservatives (potassium sorbate).